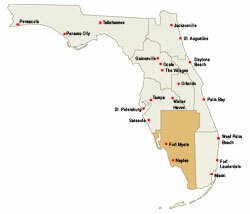 Southwest Florida and the Fort Myers area offer residents great leisure opportunities and a high quality of life. Retirees can find a quality of life in the region not found in other communities. Personal income and effective buying income has steadily risen since 1990, with the greatest recent employment growth in the home health industry. The cost of living, in comparison with cities such as Washington D.C. and Miami, FL, is far below average. Recreation is also stressed in Southwest Florida. For almost 70 years, Fort Myers has been famous for its professional baseball spring training. From February to April, both the Boston Red Sox and the Minnesota Twins call this town home. The residents of Southwest Florida value their natural environment. The region is home to the massive ecosystem called the Everglades, the River of Grass, with its 600 species of birds and animals and its 1,000 plant varieties. Bonita Springs is only minutes away from the Corkscrew Swamp Sanctuary and the northern border of the Big Cypress Swamp. It's also home to Everglades Wonder Gardens, a refuge for exotic birds and animals. Golf: Davis Love III championship golf course with River Hall Country Club featuring full service golf club, including pro shop, locker rooms, a club grille and a professional golf staff. Free equity membership to the golf club with your home purchase. Community Town Center: A community town square is planned complete with a quaint village square, a proposed firehouse and a new elementary school. Shops and services will follow as the community matures to provide the essentials and conveniences residents desire along with places to gather and work. eStreet® services: LandMar’s exclusive eStreet® services will deliver bundled cable and high speed internet throughout River Hall. Builders will include structured wiring to make every home an address on eStreet®. And a community “intranet” site will provide residents with a means to communicate with each other and share. Take 2,000 acres under the warm Florida sun. Design three distinct villages; build a school, a Town Square and community-related shops and services. Then sprinkle a Davis Love III Signature golf course, tennis courts, clubhouses, swimming pool, parks and trails, and a variety of homes throughout. What do you get? The recipe for a new hometown – River Hall. The Heritage is located in southwest Florida just a short drive from the beautiful, sandy beaches of the Gulf of Mexico. Tropical plants and birds abound in this community which is close to fishing opportunities in both fresh and salt water, making it a fisherman's paradise. Major medical centers, shopping areas, restaurants and municipal facilities are nearby. In addition to the community's 9-hole golf course, residents can enjoy the numerous championship courses in the area. The Heritage offers a superior combination of lifestyle, location and convenience.